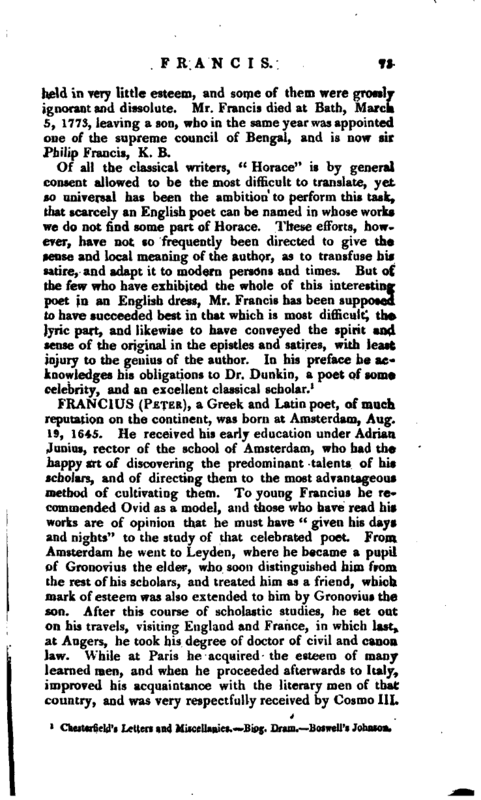 Some time after the publication of Horace, he appears to have come over to England, where, in 1753, he published a translation of part of the “Orations of Demosthenes,” intending to comprise the whole in two quarto volumes. It was a matter of some importance at that time to risk a large work of this kind, and the author had the precaution therefore to secure a copious list of subscribers. Unfortunately, however, it had to contend with the acknowledged merit of Leland’s translation, and, allowing their respective merits to have been nearly equal, Leland’s had at least the priority in point of time, and upon comparison, was preferred by the critics, as being more free and eloquent, and less literally exact. 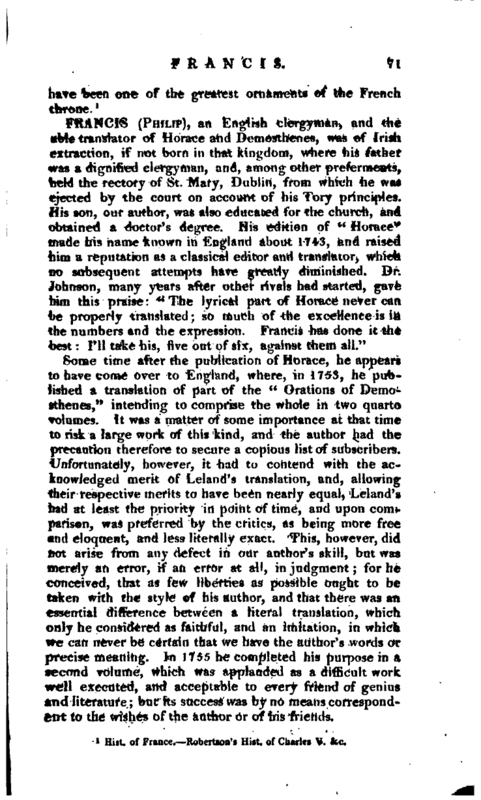 This, however, did not arise from any defect in our author’s skill, but was merely an error, if an error at all, in judgment; for he conceived, that as few liberties as possible ought to be taken with the style of his author, and that there was an essential difference between a literal translation, which only he considered as faithful, and an imitation, in which we can never be certain that we have the author’s words or precise meaning. Jn 1755 he completed his purpose in a second volume, which was applauded as a difficult work well executed, and acceptable to every friend of genius and literature; but its success was by no means correspondent to the wishes of the author or of his friends. | The year before the first volume of his “Demosthenes” appeared, he determined to attempt the drama, and his first essay was a tragedy entitled “Eugenia.” This is profesedly an adaptation of the French “Cenie” to English feelings and habits, hut it had not much success on the stage. Lord Chesterfield, in one of his letters to his Son, observes that he did not think it would have succeeded so well, considering how long our British audiences had been accustomed to murder, racks, and poison in every tragedy; yet it affected the heart so much, that it triumphed over habit and prejudice. In a subsequent letter, he says that the boxes were crowded till the sixth night, when the pit and gallery were totally deserted, and it was dropped. Distress without death, he repeats, was not sufficient to arlect a true British audience, so long accustomed to daggers, racks, and bowls of poison; contrary to Horace’s rule, they desire to see Medea murder her children on the stage. The sentiments were too delicate to move them; and their hearts were to be taken by storm, not by parley. 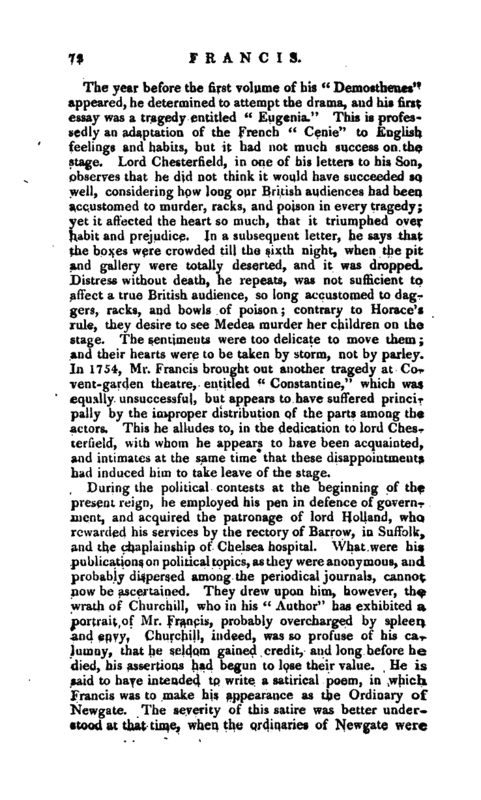 In 1754, Mr. Francis brought out another tragedy at Cuvent-garden theatre, entitled “Constantino,” which was equilly unsuccessful, but appears to have suffered principally by the improper distribution of the parts among the actors. This he alludes to, in the dedication to lord Chesterfield, with whom he appears to have been acquainted, and intimates at the same time that these disappointments bad induced him to take leave of the stage. During the political contests at the beginning of the present reign, he employed his pen in defence of government, and acquired the patronage of lord Holland, who rewarded his services by the rectory of Barrow, in Suffolk, and the chapiujnship of Chelsea hospital. What were his publications on political topics, as they were anonymous, and probably dispersed among the periodical journals, cannot now be ascertained. They drew upon him, however, the wrath of Churchjjl, who in his “Author” has exhibited a portrait of Mr. Francis, probably overcharged by spleen and. envy. Churchill, indeed, was so profuse of his calumny, that he seldom gained credit, and long before he died, his assertions had begun to lose their value. He is said to have intended to write a satirical poem, in which Francis was to make his appearance as the Ordinary of Newgate. The severity of this satire was better under. ­stood at that time, when the ordinaries of Newgate were. | held in very little esteem, and some of them were grossly ignorant and dissolute. Mr. Francis died at Bath, March 5, 1773, leaving a son, who in the same year was appointed one of the supreme council of Bengal, and is now sir Philip Francis, K. B. 1 Chesterfield’s Letters and Miscellanies. Biosj. Dram. Boswell’a Johnson.